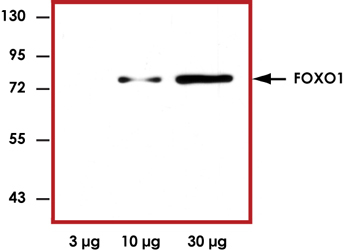 Sample Data :Representative western blot with Anti-FOXO1 (1:1000) using 3 μg, 10 μg, and 30 μg of 3T6 cell lysate. Scientific Background :Active forkhead members act as tumor suppressors by promoting cell cycle arrest and apoptosis. Increased expression of any FoxO member results in the activation of the cell cycle inhibitor p27Kip1. Forkhead transcription factors also play a part in TGF-β-mediated upregulation of p21CIP1, a process negatively regulated through PI3K (1). 1. Seoane, J. et al: Integration of Smad and forkhead pathways in the control of neuroepithelial and glioblastoma cell proliferation. Cell. 2004 Apr 16;117(2):211-23.